“Ancient wheat and broomcorn millet, recovered in nomadic campsites in Kazakhstan, show that prehistoric herders in Central Eurasia had incorporated both regional crops into their economy and rituals nearly 5,000 years ago, pushing back the chronology of interaction along the territory of the ‘Silk Road’ more than 2,000 years,” Frachetti said. 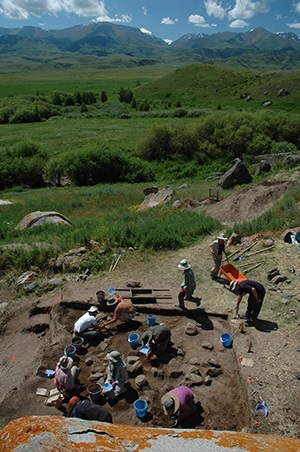 Archaeological excavations at the site of Tasbas, Kazakhstan. “This study starts to rewrite the model for economic change across Eurasia,” said first author Robert Spengler, PhD, a paleoethnobotanist and research associate in Arts & Sciences at WUSTL. “This is one of the first systematic applications of archaeobotany in the region, making the potential for further future discovery very exciting,” Spengler said. “Finding this diverse crop assemblage at Tasbas and Begash illustrates first evidence for the westward spread of East Asian and Southwest Asian crops eastward, and the surprise is that it is nomads who are the agents of change,” Frachetti said.